For neoconservatives, it seems Latin America is all about Iran. From op-eds to “Action Agendas” for the GOP-led House of Representatives, rightwing foreign policy figures are blasting the administration of President Barack Obama for not paying enough attention to the United States' southern neighbors. That purported neglect could be costly, they warn, because the Islamic Republic is allegedly strengthening ties with leaders throughout the region for one singular purpose: to better fight the United States. Latin America's growing relationship with countries in the Middle East and North Africa has come under renewed focus as the situation in Libya deteriorates. While Libyan dictator Muammar Gaddafi has been strongly criticized by much of the international community for his violent crackdown on rebels, the response from most of Latin America's leftist leaders has been muted, if not outright supportive, underscoring how the region's growing financial ties to countries in the Greater Middle East has influenced foreign policy agendas. However, while Gaddafi was in recent years strongly backed by western nations—including the United States and Britain—before the past month's events made that relationship politically untenable, Iran has long been a pariah in the eyes of the West. And conveniently for those eager for a confrontation with the Islamic Republic, its growing foothold in Latin America, they say, is directly linked—and is in fact being facilitated by—another long-time enemy of the neoconservative right: Venezuelan President Hugo Chávez. Indeed, Chávez and his Iranian counterpart, Mahmoud Ahmadenijad, have formed a “Mullah-Caudillo Axis,” in the rather unimaginative words of the American Enterprise Institute(AEI). Although the danger posed by the budding Iran-Venezuela relationship might not be as great as the more notorious axes of history, neoconservatives maintain the danger is real—and growing. With Florida Congresswoman Ileana Ros-Lehtinen, an outspoken opponent of both countries, now chairing the House Foreign Affairs Committee, they have a reliable ally in Congress who can be expected to push their agenda. 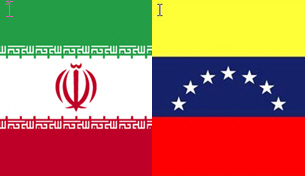 In recent years, Tehran and Caracas have grown closer. In 2010, the countries announced a joint venture to ship oil from Venezuela to European and Asian markets, which is aimed at reducing Caracas' financial dependence on exports to America, part of a “strategic alliance” intended to thwart U.S. “imperialism.” The countries have partnered for other ventures in the natural gas, textiles and agricultural sectors, with trade between the two nations valued at more than $3 billion a year. But it is not trade that is drawing the nations together and their growing ties are more than “a mere annoyance,” says Daremblum. Rather, the friendly relations between the governments of Iran and Venezuela constitute “a serious strategic menace” to the United States. The concern about Iranian embassies should sound familiar. The claim was spread throughout rightwing policy circles. Even Secretary of State Hillary Clinton picked it up. "The Iranians are building a huge embassy in Managua," she warned in 2009, just a few months after taking office. "And you can only imagine what that's for." But as the Washington Post reported in July 2009, that “huge embassy in Managua” could not be found. “It doesn't exist,” a chuckling Ernest Porta, head of the Nicaraguan Chamber of Commerce, told the paper. That claim might not have stuck. But as with the litany of dubious allegations they made before the invasion of Iraq, neoconservatives have thrown out plenty more in the time since. As part of the purported deal, missiles—including the “Iranian Shabab 3 (range 1300-1500km)”—would be deployed, she maintained, citing a single-sourced report in a German newspaper. And, pointing to a report in the New York Times, Mahjar-Barducci wrote that Iran was also developing—not placing, as stated in the headline—a new “medium range missile” based on a Russian design that could hit the continental United States. Since her piece was published, no news publications have validated her claims. The New York Times, meanwhile, was forced to retract its report about Iran developing a missile based on a Russian design, a claim it had based on an erroneous interpretation of a diplomatic cable released by WikiLeaks. And while 1,500km is indeed a long distance for a missile to go, as the missiles Iran reportedly possesses can travel, it is more than 1,800km from Venezuela to Key West, Florida. Real or not, though, neoconservatives want their allies in the GOP-led House of Representatives to do something about the “threat” posed by Iran's ties with Latin American leaders—and to put Venezuela's Chàvez on notice, beginning with severe sanctions, if not outright labeling his country a “terrorist state,” as some hardliners in Congress wish. In an October 2010 piece for Foreign Policy magazine, Noriega even suggested Venezuela was not just aiding Iran's nuclear program—the two countries have openly discussed sharing technology and research—but was itself developing a clandestine nuclear weapons program. However, that show-stopping claim of nuclear proliferation on the U.S.'s “soft underbelly” isn't mentioned in his more recent, 2,700 word policy guide for the new Congress. According to leaked State Department cables released by the whistle-blowing website WikiLeaks, U.S. diplomats have privately mocked the notion that Venezuela is assisting Iran's nuclear program or developing atomic weapons—or even capable of developing a civilian nuclear power program. Like the claims about Iran's phantom mega-embassy in Nicaragua, allegations of Venezuelan proliferation appear to have been unceremoniously dropped. In particular, the Post, which has been criticized for stacking its list of contributors with neoconservatives like Jennifer Rubinin recent years, faulted the administration for failing to stand up to what it termed “Nicaraguan aggression”—and to “would-be-president for life” Nicaraguan head of state and Sandinista leader Daniel Ortega—by failing to strongly and openly side with Costa Rica in its land dispute with Nicaragua over the San Juan river that divides the two countries. Beyond standing up to consistently reelected “anti-democratic” leftists in Latin America, though, the U.S. right is also concerned with doubling down on the war on drugs in Mexico and Colombia, claiming, as is their wont, that the Obama administration isn't doing enough. But even there, it all seems to come back to fighting Islamic terrorism. The call to ramp up support for Calderón's war on drug cartels comes despite not just the increase in violence—and the indiscernible impact on supply and demand—but at a time when an increasing number of Mexico's political elite are calling for a change in policy, with former President Vicente Fox going so far as to call for legalizing the manufacture and distribution of all drugs, from marijuana to cocaine. While not prepared to go quite that far, other former presidents from Mexico, Colombia, and Brazil took to the pages of the Wall Street Journal in 2009 to pronounce the war on drugs a “failure” and to call for a public health-based approach to illicit narcotics, rather than the militarized approach embraced by Washington. But to rightwing foreign policy figures, military cooperation on the war on drugs is a time-tested way Washington can maintain and strengthen ties with pro-American governments in Central and South America, and thus counter the purported threat of growing Iranian and Venezuelan influence in the region. And many neoconservatives see the war on drugs as almost indistinguishable from the war on terror. Indeed, Daremblum warns that drug cartels' “expertise could be put at the service of terrorists who want to enter the United States without being detected”—terrorists he and his ideological cohorts suggest would be armed and financed by Iran, citing the country's alleged involvement in attacks on the Israeli embassy and a Jewish center in Buenos Aires in the early 1990s. For years, and since the 9/11 terrorist attacks especially, neoconservatives have been itching for a military confrontation with Iran. “Real men,” after all, “go to Tehran,” as Bush administration figures who were certain to never go there themselves put it. While a preemptive attack against the notorious member of the “axis of evil” hasn't yet come to pass, neoconservatives haven't given up hope of taking on the Iranian regime—even if they have to go through Caracas to do it. Gabriel Elizondo, “Latin America's sudden silence on Gaddafi,” Al Jazeera, February 25, 2011, http://blogs.aljazeera.net/americas/2011/02/25/latin-americas-sudden-silence-gaddafi. AEI, “The Mullah-Caudillo Axis,” American Enterprise Institute, http://www.aei.org/event/100221. Jaime Daremblum, “Hemispheric Neglect,” The Weekly Standard, January 24, 2011, http://www.weeklystandard.com/blogs/hemispheric-neglect_536915.html. Jaime Daremblum, “Iran and Latin America,” Hudson Institute, January 2011, http://www.hudson.org/files/publications/Iran_Latin_America_Daremblum_Jan2011.pdf. “Iran and Venezeual deepen 'strategic alliance,'” BBC, October 21, 2010, http://www.bbc.co.uk/news/world-latin-america-11593197. Michael Rubin, “Iran's Global Ambition,” American Enterprise Institute, March 2008, http://www.aei.org/outlook/27658. Anne-Marie O'Connor and Mary Beth Sheridan, “Iran's Invisible Nicaragua Embassy,” Washington Post, July 12, 2009, http://www.washingtonpost.com/wp-dyn/content/article/2009/07/12/AR2009071202337.html. Anna Mahjar-Barducci, “Iran Placing Medium-Range Missiles in Venezuela; Can Reach the U.S.,” Hudson New York, December 8, 2010, http://www.hudson-ny.org/1714/iran-missiles-in-venezuela. Phil Stewart, "No Iran military presence in Venezuela: U.S. general,” Reuters, April 27, 2010, http://www.reuters.com/article/2010/04/27/us-venezuela-iran-usa-idUSTRE63Q45N20100427. Mark Mazzetti and William J. Broad, “Wider Window Into Iran's Missile Capabilities Offers a Murkier View,” New York Times, December 3, 2010, http://www.nytimes.com/2010/12/03/world/middleeast/03wikileaks-missile.html. Roger F. Noriega, “Latin American Action Agenda for the New Congress,” American Enterprise Institute, January 2011, http://www.aei.org/outlook/101014. Roger F. Noriega, “Chávez's Secret Nuclear Program,” Foreign Policy, October 5, 2010, http://www.foreignpolicy.com/articles/2010/10/05/chavez_s_secret_nuclear_program. Rory Carroll, “WikiLeaks cables dismiss Hugo Chávez's nuclear ambitions,” The Guardian, December 9, 2010, http://www.guardian.co.uk/world/2010/dec/09/wikileaks-cables-venezuela-chavez-nuclear. Editorial, “Obama administration seems soft on Nicaraguan aggression,” Washington Post, December 25, 2010, http://www.washingtonpost.com/wp-dyn/content/article/2010/12/25/AR2010122501786.html. Fernando Henrique Cardoso, César Gavira and Ernesto Zedillo, “The War on Drugs Is a Failure,” Wall Street Journal, February 23, 2009, http://online.wsj.com/article/SB123535114271444981.html.